German intercontinental boost-glide missile. 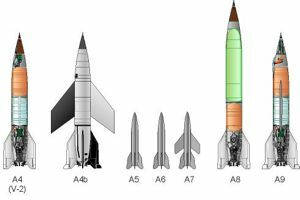 The A9/A10 was the world's first practical design for a transatlantic ballistic missile. 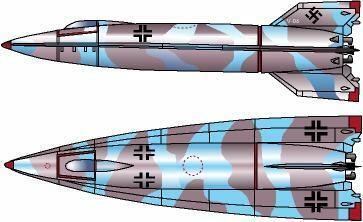 Design of the two stage missile began in 1940 and first flight would have been in 1946. Work on the A9/A10 was prohibited after 1943 when all efforts were to be spent on perfection and production of the A4 as a weapon-in-being. Von Braun managed to continue some development and flight tests of the A9 under the cover name of A4b (i.e. a modification of the A4, and therefore a production-related project). In late 1944 work on the A9/A10 resumed under the code name Projekt Amerika, but no significant hardware development was possible after the last test of the A4b in January 1945. Status: Cancelled 1945. Payload: 1,000 kg (2,200 lb). Thrust: 2,000.00 kN (449,600 lbf). Gross mass: 85,300 kg (188,000 lb). Height: 41.00 m (134.00 ft). Diameter: 4.12 m (13.51 ft). During the course of development, the vehicle evolved. The first stage, the A10, was first to have used a multi-chamber design: a cluster of 6 A4 combustion chambers feeding into a single expansion nozzle. Later a massive single chamber/single nozzle engine was planned. Test stands were built at Peenemuende for firings of the 200 metric ton thrust engine. 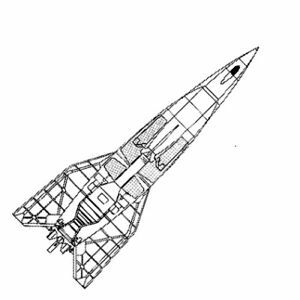 The original second stage A9 design was a refined A4 with swept wings. A later version had two fuselage strakes instead of wings. Wind tunnel tests showed that these provided better supersonic lift and solved the problem of transonic shift of center of lift. A secondary benefit was better packaging of the A9 into the forward interstage of the A10. Guidance systems of the time were hopelessly inaccurate at the 5000 km range planned for the A9/A10. Therefore it was decided that the A9 would have to be piloted. After cut-off of its engine at 390 km altitude and 3,400 m/s, the A9 would re-enter and begin a long glide to extend the range. The pilot was to be guided by radio beacons on surfaced German submarines in the Atlantic Ocean. After reaching the target the pilot would lock in the target in an optical sight, then eject. Death or internment as a prisoner of war would follow. Work on the A9/A10 was prohibited after 1943 when all efforts were to be spent on perfection and production of the A4 as a weapon-in-being. Von Braun managed to continue some development and flight tests of the A9 under the cover name of A4b (i.e. a modification of the A4, and therefore a production-related project). In late 1944 work on the A9/A10 resumed under the code name Projekt Amerika, but no significant hardware development was possible after the last test of the A4b in January 1945. Designs beyond the A9/A10 were sketched out as well. Adding an A11 stage would have resulted in a satellite launcher. 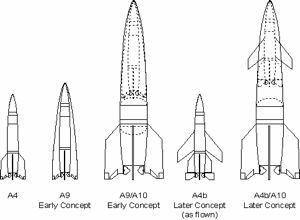 An additional A12 stage would result in a four stage vehicle with the A9 being a manned orbital space shuttle. Post-war refinement of the intercontinental missile concept in America and Russia went down two paths. On the one hand, it was found that it would be much more efficient for the A9 second stage to use a ramjet to extend the range to the 10,000 km true intercontinental range needed for the post-war adversaries to attack each other. This path led to the American Navaho and Soviet Buran and Burya missiles. On the other hand, improvements in rocket structures and engine efficiencies made it possible to design pure ballistic vehicles with cut-off velocities over twice as high as the A9/A10 and 10,000 km ranges. In the end, these faster, uninterceptable designs won out. Payload: 1,000 kg (2,200 lb) to a 5,000 km range. Maximum range: 5,000 km (3,100 mi). Stage 1. 1 x A-10. Gross Mass: 69,043 kg (152,213 lb). Empty Mass: 16,993 kg (37,463 lb). Thrust (vac): 2,306.896 kN (518,611 lbf). Isp: 247 sec. Burn time: 55 sec. Isp(sl): 210 sec. Diameter: 4.12 m (13.51 ft). Span: 9.00 m (29.50 ft). Length: 20.00 m (65.00 ft). Propellants: Lox/Alcohol. No Engines: 1. Engine: A-10. Status: Study 1942-1945. Stage 2. 1 x A-9. Gross Mass: 16,259 kg (35,844 lb). Empty Mass: 3,000 kg (6,600 lb). Thrust (vac): 288.678 kN (64,897 lbf). Isp: 255 sec. Burn time: 115 sec. Isp(sl): 220 sec. Diameter: 1.65 m (5.41 ft). Span: 3.20 m (10.40 ft). Length: 14.18 m (46.52 ft). Propellants: Lox/Alcohol. No Engines: 1. Engine: A-9. Status: Development 1945. Family: Boost-glide. People: von Braun. Country: Germany. Engines: A-10 engine, Model 39a. Spacecraft: A-9. Launch Sites: Peenemuende. Stages: A-10, A-9 stage. Bibliography: 47, 394, 693. November 1939 - . Launch Site: Peenemuende. Launch Complex: Peenemuende. LV Family: V-2. Launch Vehicle: A-4b, A9/A10. Peenemuende wind tunnel goes into operation. - . Nation: Germany. The tunnel was used an average of 500 hours per month. 1000 cubic metres of vacuum vessels were pumped to a 98% vacuum in three to five minutes by three banks of double vacuum pumps. When vented, they provided the tunnel with 20 seconds of run time at velocities from Mach 1.2 to Mach 4.0, or 1500 m/s. Models 4 to 5 cm in diameter x 30-40 cm long could be accommodated in the tunnel, instrumented at 110 data points. These tests showed that drag increased 70% at the sound barrier and that the centre of pressure on the missile moved back one-half calibre. The wind tunnel runs showed that the basic A4 shape was all right, but that it needed load-carrying wings and a new rudder for the higher-speed A9 glider version. Huge trial and error was required to develop an A9 configuration that was stable, but not so stable that the control surfaces were too large. An arrow wing was the best performing, but the control surfaces were then in the turbulent flow of the wing and inadequate. Swept wings provided 12% less glide ratio than the arrow wing, resulting in a 60 km loss of range. Trapezoidal wings were the final solution, the end of a long iterative process. Peenemuende-developed delta wings were adapted to Army artillery rounds of the 105 mm flak gun and K5 280 mm cannon, decreasing drag by 35%. The result was an increase of 6 kg in the explosive load, a 6 kg increase in the iron mass of the round, but with a range increase from 59 to 90 km. Equipped with a new, lighter warhead, and a sabot boosting a slimmer round, the gun could shoot projectiles to a range of 135 to 150 km, with an accuracy of 2 per mill. Late 1939-1943 - . Launch Site: Peenemuende. Launch Complex: Peenemuende. LV Family: V-2. Launch Vehicle: A9/A10. A9 basic research and design - . Nation: Germany. By adding wings to the A4, the 800 m/s of kinetic energy the rocket had at cut-off could be exploited in a glide attack, extending the range of the missile from 250 km to 550 km. Such a supersonic aircraft had never been flown and presented many aerodynamic and engineering problems in 1943. Various tests of the A4's with wings began in early 1940. These were successful, and the configuration was dubbed the A9. The trajectory for such a missile involved a boost to an apogee of 29 km, then a stable glide at 20 km altitude at a speed of 1250 m/s. At the end of the glide, the missile would have descended to 5 km altitude, then make a vertical dive on the target in the fashion of the Fi-103/V-1. The A9 would be equipped with wings with a total area of 13.5 sq m. A manned version of this boost-glide rocketplane was also designed. This could reach a conventional airfield 600 km from the launch point in only 17 minutes, landing at a speed of 160 kph. 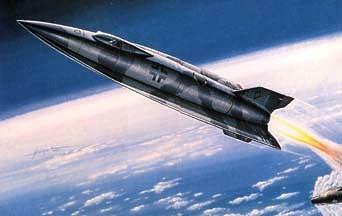 Another possibility to further extend range would be a catapult-launched A9, using the technology developed for the V-1. This would provide an extra velocity of 350 m/s, further extending the missile's potential range. 1940 - . LV Family: V-2. Launch Vehicle: A9/A10. Design A9/A10 of the two stage transatlantic ballistic missile began in 1940. - . Nation: Germany. First flight would have been in 1946. Work on the A9/A10 was prohibited after 1943 when all efforts were to be spent on perfection and production of the A4 as a weapon-in-being. Von Braun managed to continue some development and flight tests of the A9 under the cover name of A4b (i.e. a modification of the A4, and therefore a production-related project). In late 1944 work on the A9/A10 resumed under the code name Projekt Amerika, but no significant hardware development was possible after the last test of the A4b in January 1945. December 1941 - . Launch Site: Peenemuende. Launch Complex: Peenemuende. LV Family: V-2. Launch Vehicle: A9/A10. Mach 10 wind tunnel designed. - . Nation: Germany. In preparation for the A9/A10 transatlantic missile, the Peenemuende team completed design of a Mach 10 wind tunnel. However construction would not begin for another two years due to priority on devoting all available engineering time to getting the A4 into production. End 1942 - . Launch Site: Peenemuende. Launch Complex: Peenemuende. LV Family: V-2. 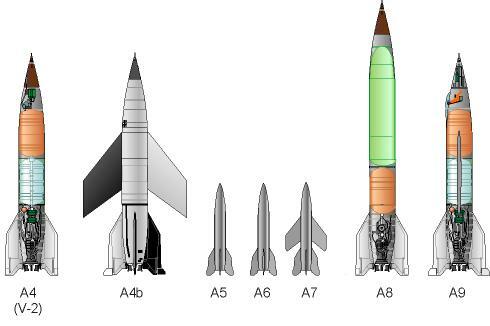 Launch Vehicle: A9/A10, A9/A10/A11, A9/A10/A11/A12. Peenemuende team's spaceflight plans - . Nation: Germany. Using catapults and wings an A9 might nearly achieve 1000 km range, but the only solution for transatlantic missions was the two-stage A9/A10. The A10 boost stage was to have a total mass of 87 tonnes, of which 62 tonnes would be propellant. 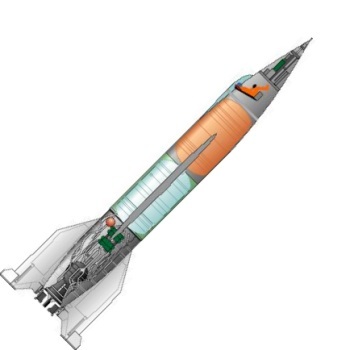 The stage's 200 tonne thrust motor would burn for 50 to 60 seconds, taking the A9 upper stage to 1200 m/s. Then the A9 would separate and burn its engine, reaching an apogee of 55 km, followed by a long hypersonic glide in the atmosphere. The second stage would be equipped with air brakes for deceleration over the target, followed by a parachute for recovery in the water. The A9/A10 would reach a maximum velocity of 2800 m/s, and have a range of 4100 km, and a total flight time of 35 minutes. Full-scale development was underway, when further significant work on the project was stopped at the end of 1942. Only the Advanced Projects Group, under the direction of Dip-Ing Roth and Ing Palt, continued design of the missile. It was also planned to develop, after the war, a stratospheric rocket that could travel in 40 minutes from Europe to America. 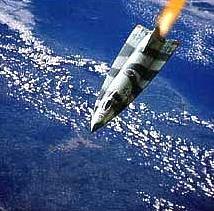 After that, the target was orbital spaceships that could reach 8 km/sec and 500 km orbital altitude. Beyond that, space stations and the burial in space of the embalmed bodies of the rocket developers and men of the rocket service. Manned expeditions to the moon were also a popular theme for research. Finally, the use of nuclear energy to achieve interstellar travel was studied by the Advanced Projects Group. 1943 - . LV Family: V-2. Launch Vehicle: A9/A10. Further work on the A9/A10 ICBM was prohibited - . Nation: Germany. All efforts were to be spent on perfection and production of the A4 (V-2) as a weapon-in-being. Von Braun managed to continue some development and flight tests of the A9 under the cover name of A4b (i.e. a modification of the A4, and therefore a production-related project). December 1943 - . Launch Site: Peenemuende. Launch Complex: Peenemuende. LV Family: V-2. Launch Vehicle: A9/A10. Mach 10 wind tunnel construction begins. - . Nation: Germany. A4 development is completed, so Peenemuende engineers can turn to full-scale development of the A9/A10. Construction of a Mach 10 wind tunnel to test hypersonic aerodynamic configurations for the missile begins..
1944 November - . LV Family: V-2. Launch Vehicle: A9/A10. Work on the A9/A10 ICBM resumed under the code name Projekt Amerika, - . Nation: Germany. No significant hardware development was possible after the last test of the A4b upper stage in January 1945..